Is Soundgarden better than The Smiths? Does graffiti art have a place in Boston? What are the merits of hip-hop? Four of the 12 candidates running for mayor, who have spent weeks discussing sober topics like crime and overhauling the school system, confronted these and other topics Thursday during a Boston.com forum that focused on the arts. During the hourlong forum, radio station owner Charles Clemons and city councilors Michael P. Ross, John Connolly, and Rob Consalvo seemed relaxed, joking easily as they debated how to make the city hipper and friendlier to musicians and artists. “Sometime I feel we’re in the movie ‘Footloose,’ ” quipped Ross, 41, referring to the 1984 Kevin Bacon film about a town whose elected officials refused to let high school students dance. Promoters have to wait too long on permits for art and music shows, and the city resists too fiercely requests to hold concerts for those 18 years and older, Ross said. Such a strict policy drives many to hold illegal musical shows in their basements, which police then crack down on, he said. 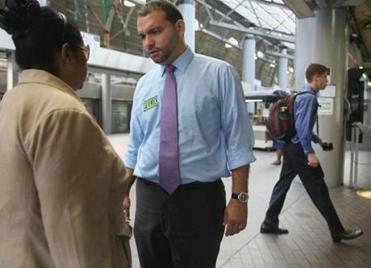 Felix Arroyo, one of the candidates running for mayor of Boston, spoke with Damari Jimenz at Ruggles MBTA Station in Boston Thursday. Mayoral candidates’ schedules as provided by their campaigns. Connolly, who is 40, agreed, saying police do not want to spend their time trolling social media websites looking to find out where the next impromptu concert is going to be. He crowed about the work being done at Bartlett Yard, a temporary art and music space in Roxbury at the Bartlett Bus Yard that graffiti artists have covered in murals. Connolly noted that organizers have said they went through a cumbersome process at City Hall which required that they obtain several permits from multiple agencies. “We need to be customer friendly,” he said. All four candidates agreed that nightclubs should be allowed to stay open longer and that the hours the MBTA operates within the city should be extended. Consalvo, 44, who claimed to be a break-dancer in the 1980s, said the next mayor should be creative about where musical acts can perform, noting there are several venues in Hyde Park, part of his district. But, he said, as mayor he would welcome his favorite band — The Smiths, the English indie rock quartet — to reunite at City Hall and perform. His eyes lit up when Connolly said as a college student he loved alternative music. “What’s your favorite Smiths song?” he asked. “I detest new wave, Rob,” Connolly responded. “I’m more of a Soundgarden kind of guy,” referring to the Seattle grunge rockers. The candidates were then asked what would be the most difficult challenge as mayor. “Getting the city [residents] to love and respect each other,” Clemons said. “Less time with my three children,” said Consalvo. Connolly, also a father of three, agreed. Ross, who is single, said: “Maybe starting my process to get three children? Councilor Rob Consalvo released a more detailed education plan Thursday, promising to create more kindergarten-through-eighth grade schools, ramp up vocational studies, and expand early education programs so more pupils can enroll in prekindergarten. Education has been one of the hottest topics in the mayoral race. Most of the 12 candidates are trying to stand out as the most qualified to overhaul the school system and deal with a powerful teachers union opposed to creating more charter schools. While many of the candidates support expanding the number of charter schools, Consalvo backs capping the number of them in Boston. The father of three children who are 3, 9, and 10, Consalvo said he has the most credibility of the candidates on education and with the Boston Teachers Union. The union has 5,000 members living in the city. “I think the union is just dying for a mayor like myself who has children in the system, who is pro-public schools, who is pro-teacher,” Consalvo said. He said he wants to “revolutionize” Madison Park High School, the city’s vocational school, so that it would become a career learning center, open on nights and weekends. He said the city needs more vocational technical programs that emphasize science, math, and environmental technology. “We want to train the students who will invent the next windmill and solar panel, and we want to train the next students who can repair the next solar panel and windmill,” he said. Consalvo said one way to pay for the extended hours could be to recruit private businesses to support the venture. More online: For profiles of candidates and where they stand on key issues, go to bostonglobe.com/mayor.